Customers may be curious about the reduced late night service through this Thursday on the subway in downtown Los Angeles. The above photos explain the reason: trains are single-tracking to accommodate some much needed tunnel cleaning that is taking place to ensure Metro has a clean, safe and reliable rail system. Thank you for your patience and Metro apologizes for any inconvenience. Red & Purple Line: Sun, Mar 17-21: due to maintenance after 8:30pm, Red Line will run every 20 min (10 min delay) and Purple Line will only run between Wilshire/Western and Wilshire/Vermont. Red Line Boarding Change: Red Line will single track at Civic Ctr, Pershing Sq and 7th/Metro. Purple Line Service Change: Purple Line will ONLY run between Wilshire/Western and Wilshire/Vermont. For travel to/from Downtown stations, transfer with Red Line at Wilshire/Vermont. Follow announcements at Wilshire/Vermont for proper boarding location. Train Length Change: Due to reduced service, Red Line will run with 6-car full platform trains. Why is service being changed? 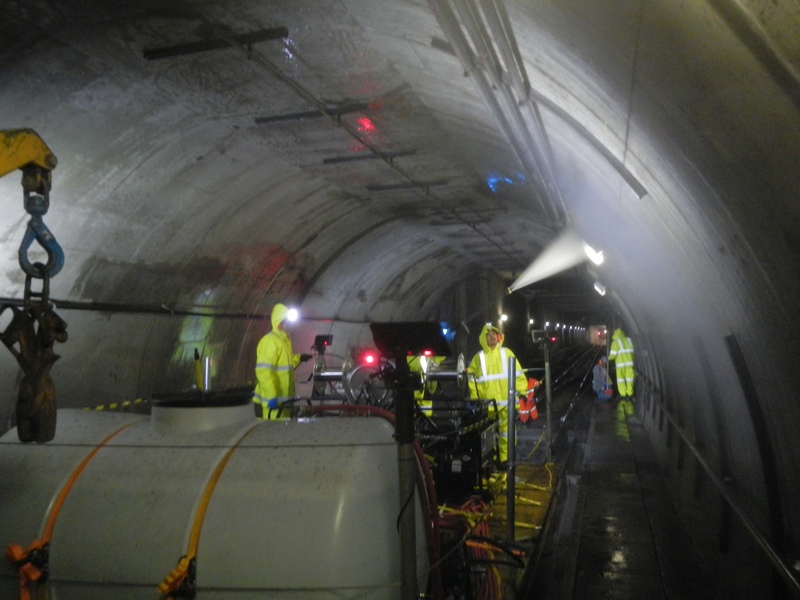 Facilities Maintenance will perform tunnel washing to ensure clean, safe and reliable Metro Rail service. 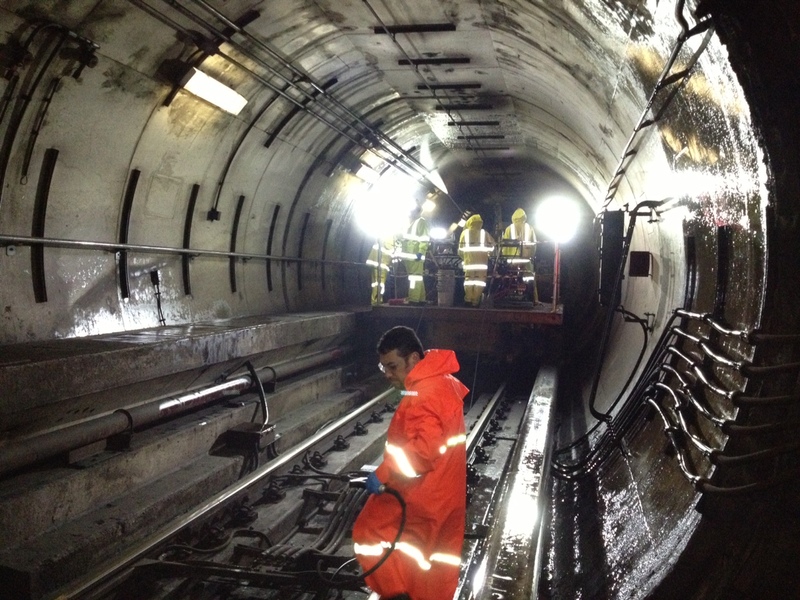 Do London and New York pressure wash their tunnel? And if so, how often? Have you seen the NYC subways? Horrendously filthy!! And not just the tunnels. You see rats on the tracks, the walls are disgusting in the station. For such a celebrated transit system it really is sickening. I really appreciate the fact that reduced service advisories due to maintenance now include what maintenance is being completed. It makes it less frustrating when you know what’s going on. The station walls at Pershing Square, 7th St./Metro Center, MacArthur Park/Westlake are covered in dried sewage lecks of human feces/waste. It looks really disgusting to look at it when being at these stations when waiting for a train to arrive. I don’t believe that’s a widespread issue — I’m glad I’ve never witnessed that issue and I’m in those stations on a somewhat frequent basis. In the future, if you ever do see something like that it would be great if you could contact Metro customer relations with the info when you’re back from underground and have internet access. The email is simple: customerrelations@metro.net. Why is it that when we Americans build mass transit, it becomes so dirty and disgusting, but when the Asians build them, they remain clean and spotless? My hunch is that the tunnels must be cleaned no matter what continent they’re on (or under). Hopefully they will clean the walls, ceilings and the art the stations too. they are filthy! Because in Asia, mass transit actually makes enough revenue to hire and staff a team of janitors to clean their stations every night. One of the ways they earn revenue is from collecting rent from the businesses that operate directly at the stations. Does Metro earn rental income from their stations? No, in fact it earns no money at all. Our stations are vast open spaces of concrete which earns nothing, therefore it can’t hire janitors to clean up the place every night. It’s not any more different from how shopping malls and airport terminals open up every day clean despite seeing so many people during the day. It’s because shopping mall owners and the airport authority makes enough revenue by collecting rental income from the shops and businesses within the mall and the airport terminals to afford hiring and staffing janitors to clean up the place every night. Unfortunately, Metro is doesn’t believe in the idea of developing the stations themselves as money makers. They’re more afraid that it will cause them to become even dirtier, when it’s the exactly opposite the case. They fail to understand how they can very easily transform the stations from being big money losers into big money makers and use some of that revenue to hire and staff janitors to clean the place every night. It’s a win-win-win-win situation of help creating more local businesses, creating more jobs, helping the local economy and keeping the place clean, but Metro fails to understand this simple and most basic business concept.